The research is based on field data from more than 1 million federal crop insurance records between 1995 and 2012 and correlated with fine-scale weather data. It shows that while corn yields in the Midwest have steadily risen, the staple grain is also growing more sensitive to drought. 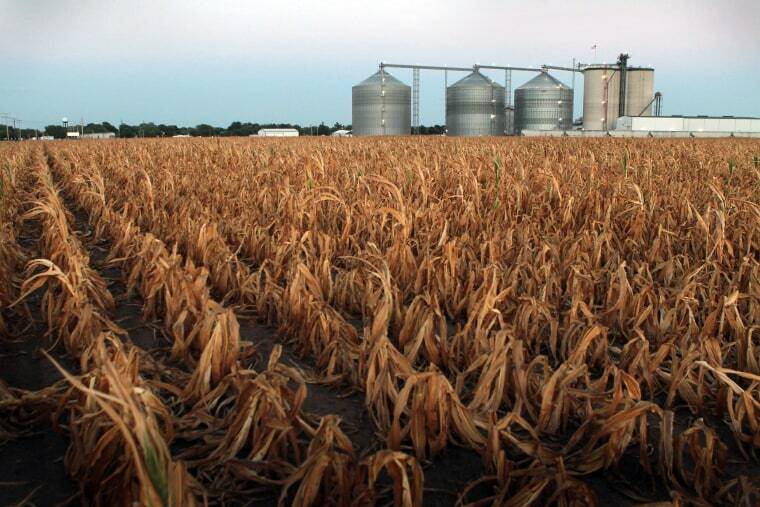 About 80 percent of the corn grown in the Midwest is dryland. If it doesn't rain, there is no water. "What we're seeing over the last 15 to 20 years is very little (yield) growth in bad conditions, which tend to be very hot and/or dry, and much, much better growth during good conditions, which usually means a moderate amount of moisture and not too much extreme heat," Michael Roberts, an associate professor of environmental economics at the University of Hawaii at Manoa, told NBC News. That doesn't bode well for the future, he said, given that climate models indicate the Corn Belt will become hotter, with more episodes of extreme heat similar to 2012, which proved devastating to the corn harvest. If the trend of increasing sensitivity continues, yields could fall as much as 30 percent by mid-century, Roberts and colleagues reported Thursday in the journal Science. If so, Roberts said, the price of staple grains are likely to spike, given that about 40 percent of the world's corn is grown in the Midwest. The price increases will be felt most strongly in the developing world by "people who live on a dollar or two a day and spend more than half of their money on food and most of that food is just staple grains," he said. Prices in the United States will also rise, but the effect is less noticeable. Most of the corn in this country, Roberts explained, is fed to chicken, hogs and cattle. People thus mostly eat corn in the form of meat, eggs, and dairy as well as processed foods and drinks made with high-fructose corn syrup. Most of the cost of these items, he noted, comes from the labor needed to process and bring them to market. Hope to avoid falls in yield and the consequent food price spikes may come from continued genetic improvements as well as improved farming practices that increase the resiliency of corn to stress from extreme heat and drought, according to Tony Vyn, an agronomist at Purdue University in West Lafayette, Indiana, who was not involved with the new research. "Now I don't think that is going to be very easy to accomplish," he told NBC News. "And it is going to be expensive to accomplish. But I hold a little more hope." According to the research, over the last few decades, corn in the United States has been modified with new traits such as more effective roots to access water and built-in resistance to pests. In turn, this has allowed farmers to plant seeds closer together in their fields, an increase in density that boosts yields during years with favorable weather conditions. But, the densely planted corn uses up the available water more quickly when the temperature spikes, resulting in lower yields. "You get a heat wave and you tend to have a lack of humidity and the water just flies out right through the plants," Roberts said. That's because plants need to pull in carbon from the atmosphere through small openings in their leaves to grow. As they do, water escapes. "The only real solution will be to avoid CO2 emissions that will otherwise cause rises in temperature." Increased density does likely make corn more sensitive to drought stress, Vyn said, but there may be other factors at play for the dwindling yields in bad conditions observed by Roberts and colleagues. For example, yields decrease more in drought conditions in fields that were planted in corn the previous year instead of soybeans, which add nitrogen to the soil. In addition, farm machinery has improved to allow farmers to plant their fields in a narrow window of time. As a result, more corn flowers at the same time, a three-week period in which they are particularly vulnerable to drought. If a hot spell hits in this critical period, the damage can be severe. "One of the agronomic ways of dealing with climate change and drought stress is to intentionally … try and spread out the actual flowering date as much as possible in an individual farm operation," Vyn said. Other strategies to enhance the outlook for corn in a warmer world include genetic improvements to how efficiently the plants use water, University of Illinois crop scientists Donald Ort and Stephen Long note in a perspective article also published Thursday in Science. For example, plants could be engineered to photosynthesize closer to the ground, where it is more humid. What's more, they noted, rising concentrations of carbon dioxide — the main driver of global climate change — actually serve to increase the water use efficiency of plants because they don't have to open their pores as wide to take up carbon. But all of this only goes so far, they conclude. "The only real solution will be to avoid CO2 emissions that will otherwise cause rises in temperature."